Javier Goya y Bayeu (1828); Mariano Goya y Goicoechea (1854); Federico de Madrazo (c. 1855-1860); Jules Boilly, Paris (sale, Hôtel Drouot, Paris, 19-20 March 1869, lot 48, an album of 20 drawings, to Leurceau); Hyadès, Bordeaux; private collection, Paris; Alfred Strölin, Lausanne, Switzerland, 1933; purchased by Ian Woodner, New York, June 1987; by inheritance to his daughters, Andrea and Dian Woodner, New York, 1990; gift to NGA, 1993. Goya in der Krise seiner Zeit, Württembergerischer Kunstverein, Stuttgart and Munich, 1980-1981, no. 214. Goya and the Spirit of Enlightenment, Museo del Prado, Madrid and tour, 1988-1989, no. 167 (Boston and New York only). Master Drawings from the Woodner Collection, Metropolitan Museum of Art, New York, 1990, no. 143. The Touch of the Artist: Master Drawings from the Woodner Collections, National Gallery of Art, Washington, 1995-1996, no. 99, as Mendigos que se llevan solos en Bordeaux (Beggars Who Get about on Their Own in Bordeaux). Goya's Last Works, The Frick Collection, New York, 2006, no. 31. Master Drawings from the Woodner Collections, National Gallery of Art, Washington, 2006-2007. Goya: Order & Disorder, Museum of Fine Arts, Boston, 2014-2015, no. 212, repro. Mayer, August L. "Dibujos Desconocidos, de Goya" Revista Española de Arte. (September 1933): repro. 382, 384. Mayer, August L. "Some Unknown Drawings by Francisco Goya." 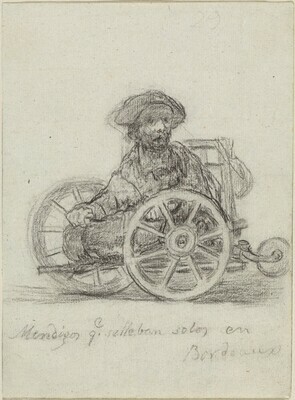 Old Master Drawings 34 (1934): 21. Gassier, Pierre and Juliet Wilson. The Life and Complete Work of Francisco Goya. New York, 1971: no. G.29. Gassier, Pierre. Francisco Goya Drawings, The Complete Albums. New York, 1973: no. G.29 . Tomlinson, Janis. Francisco Goya y Lucientes. London, 1994: 268, repr. 270. Hughes, Robert. Goya. New York, 2003: 397, repro. Brown, Jonathan and Susan G. Galassi. Goya's Last Works. New York, 2006: 186, fig. 31.